Let’s see all those finished nurseries and nursery project! 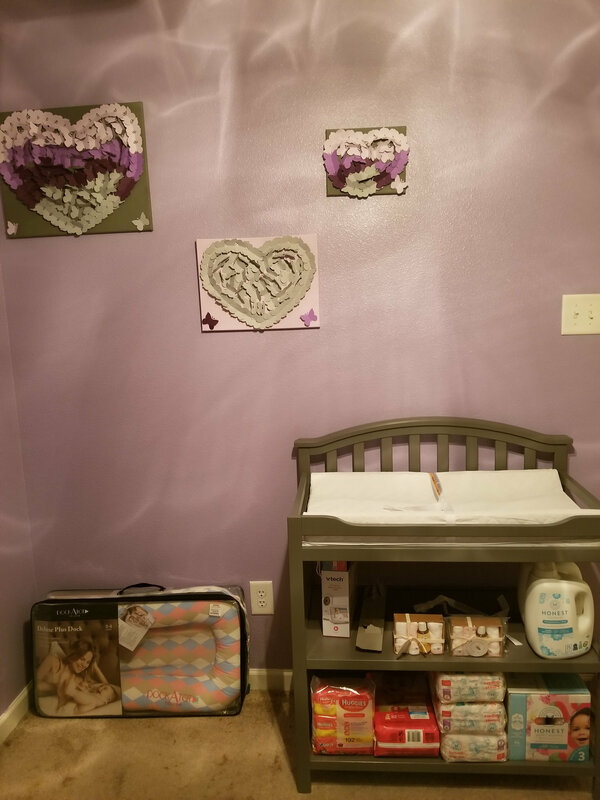 Re: Show Off the Nursery! @valentynsi Not me! Our nursery is currently covered in plaster dust. Definitely not ready. We are still cleaning ours out so we can turn it to the nursery. 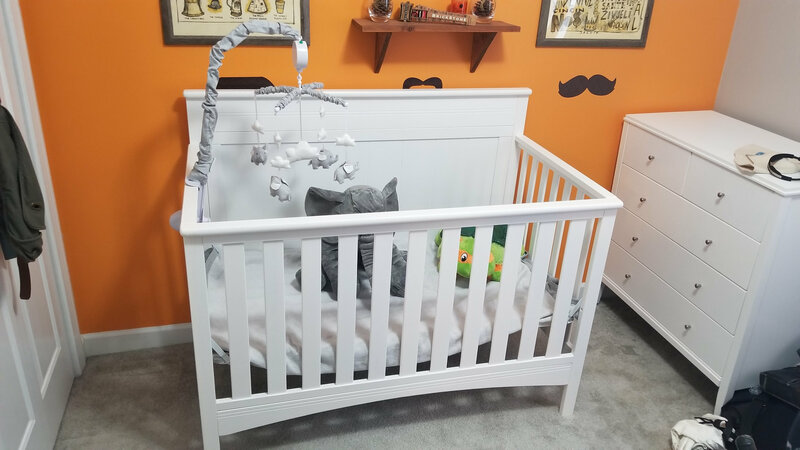 I would love to see any of your inspiration pictures or ideas for your nurseries too! 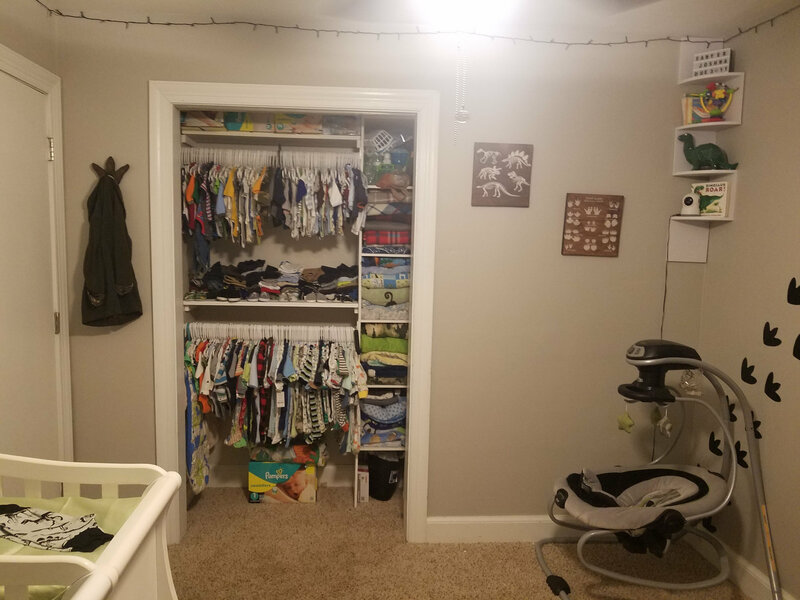 Not really a full nursery, but this is the nook in our master where we’ll be putting LO. 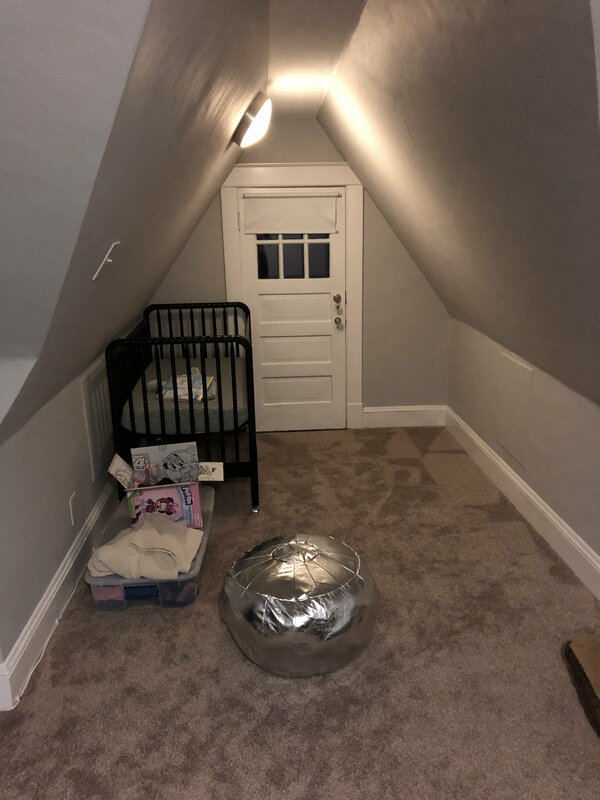 DD1’s crib is in here already, a couple clothing gifts we got for DD2, the pouf/footstool I got. I still need to swipe the glider from DD1’s room but I’m trying to do it gradually. I’ll probably use the pack n play with diaper change station we have instead of moving the whole dresser. I’ll rearrange the furniture once everything is in here, as much as I hate to block the exit the crib is on wheels and this door goes to the balcony anyway. Still a work in progress over here. We did finally get our glider / recliner this weekend. Still need to hang mirror, shelves and name for flower thing. Holding my breath for the PB curtains I want a decent sale (prob wishful thinking)! Otherwise, it’s just little odds and ends still needed. It’s not done yet, but we are making progress. We are trying to get it done early so we can be prepared should they come early, and because I may get too big to do much. PCOS, plus some medical issues that make me high risk. Our rainbow babies are due 3/21!!!!! 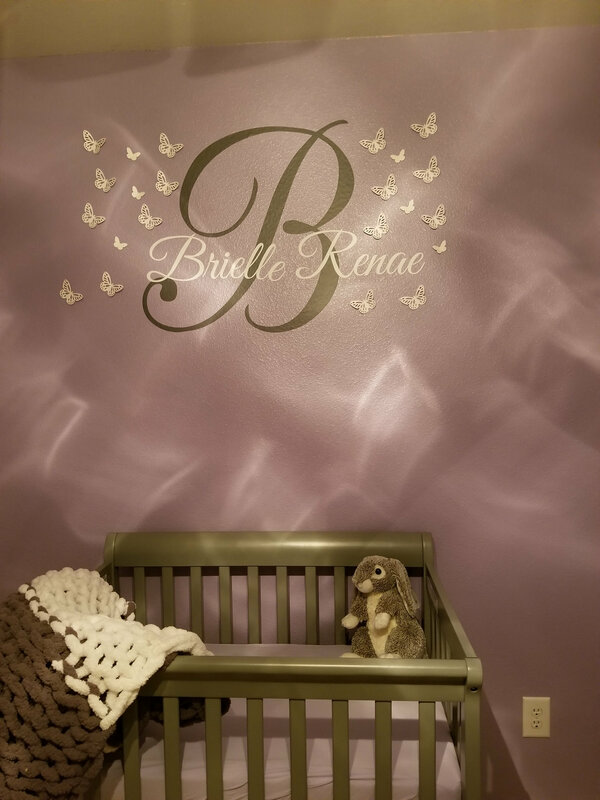 @3rdtime_charmed I just noticed the buck and doe above the cribs! So cute and subtle! @meggyme thank you!! I am still going to order name signs to go underneath the deer, but I really like the way it came together. It came as sort of a kit (vinyl decals) that was a little more DIY than I intended. The deer were supposed to be “on the ground” but I decided to rearrange them. Yea I’ve got nothing going on here. Love seeing everyone’s progress though! 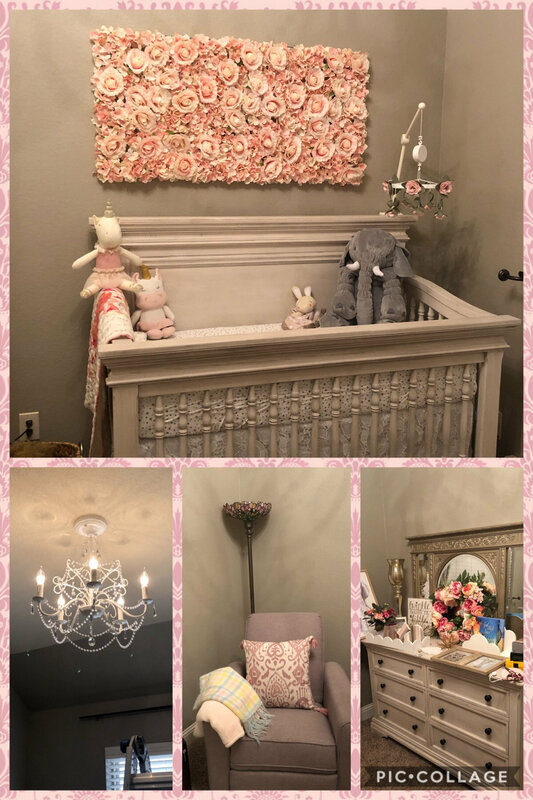 Hoping to have DD1 moved into her new room by Christmas so we can reassemble the crib and bam...nursery will be done! I’ll just have organizing to do after that. 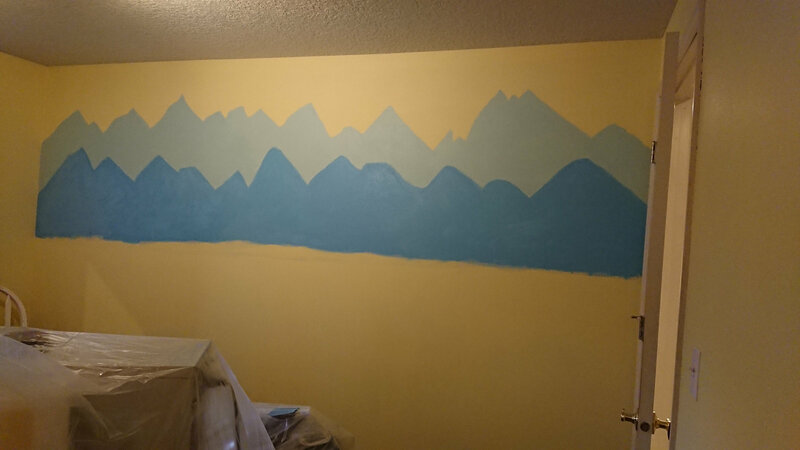 I started the mural today!! I need more blue to continue since we just got samples sizes, but I'm so excited about this!! @meggyme What a perfect little spot! 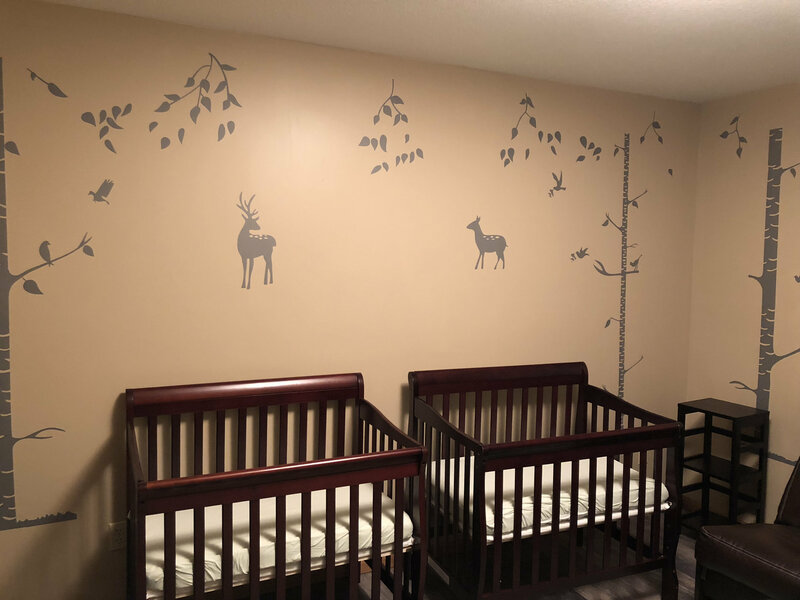 DH finally finished painting the nursery!! We have no furniture yet but we got our road construction decals the other day. 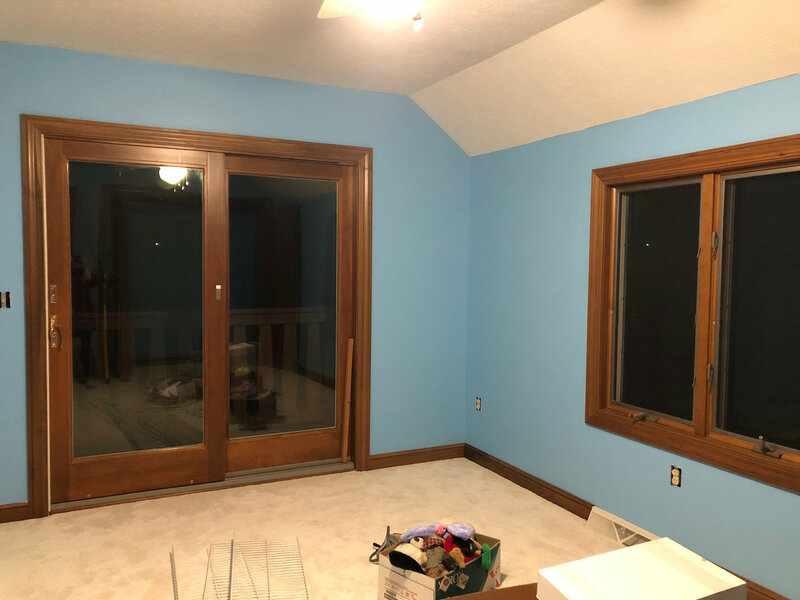 Going to add some gray touches to bring in concrete colors (most likely the furniture) but I just love how vibrant the color is. The picture doesn’t quite do it justice. 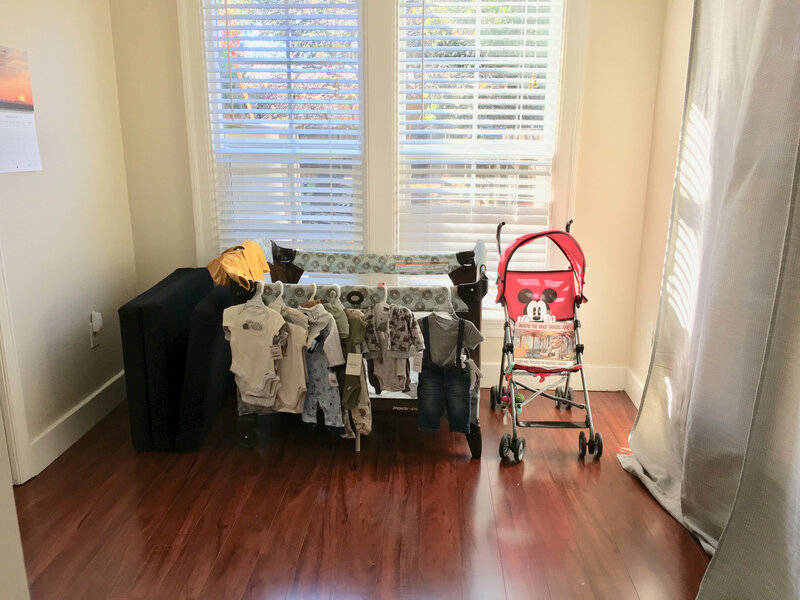 I love all of your progress.. we are using DH “office/extra storage room” as our babies room so we aren’t anywhere close at the moment. I’m hopeful we will get further along after Christmas decorations are put up. In the meantime I love seeing all your work. Loving all the updates! I will probably get a start on ours in January. 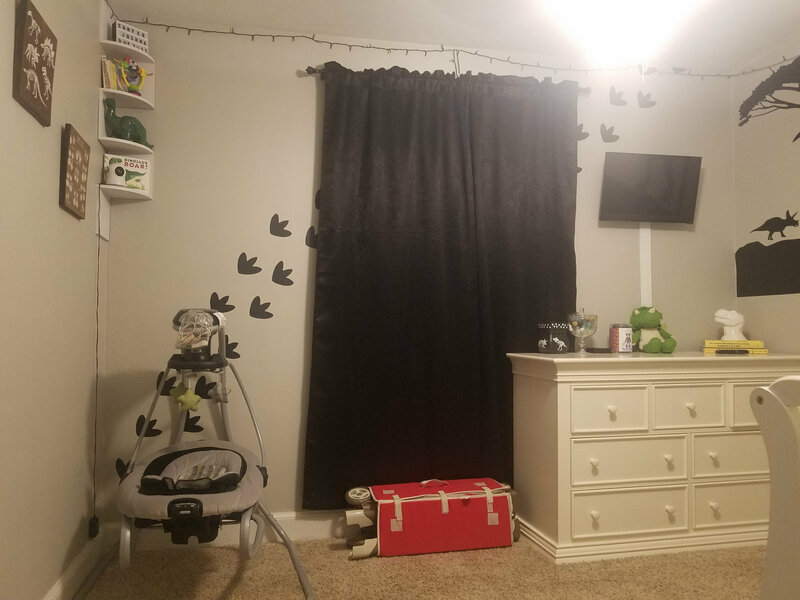 Moving my son out of the room this month, then will have the chance to play around with how I want it to look. Sorry about the triple post, but I finished the mural and I'm so proud of it!!! @abbykwail - that looks awesome! I love it! Did you stencil or freehand it? @catlady2015 thank you!! I freehanded it! 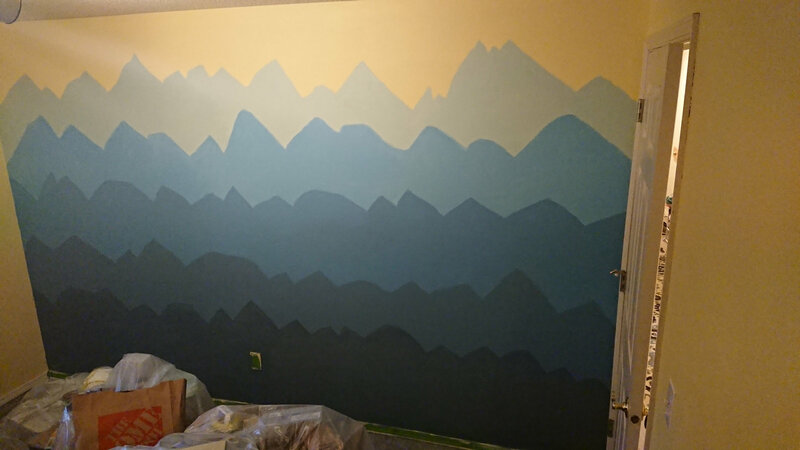 The lightest segment is very roughly based on a mountain here called 3 fingered jack, but I figured it is overall a very forgiving mural, so I didn't worry about following anything too closely, except for approximate proportions (which I based on the amount of paint I had)! 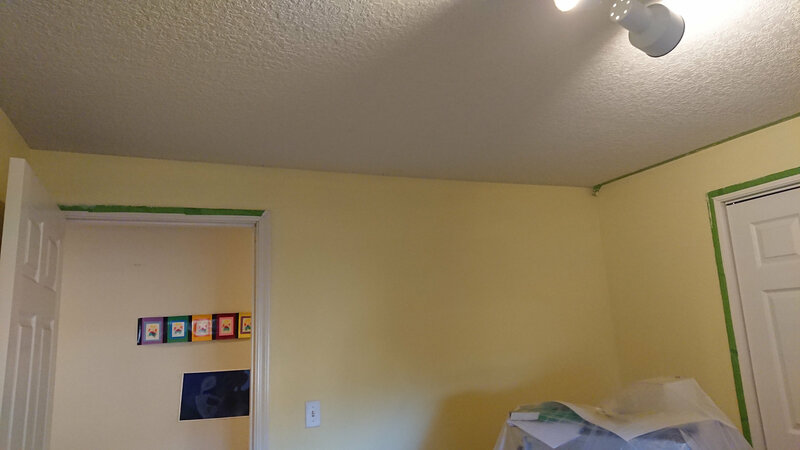 I ended up using 1 sample size each of white and black, and 3 of the same shade of blue (but there is some left in one of the blues and both black/white) and for the top two shades I mixed in a little of the yellow that the background/rest of the room is painted. @abbykwail Love it!! You did so good! i wish I had the nerve to do what you did! @kristimh80 Thank you!!! It isn't as hard as I thought it would be! I looked at a toonnn of wall murals on pintrest before starting and there were some helpful pictures. 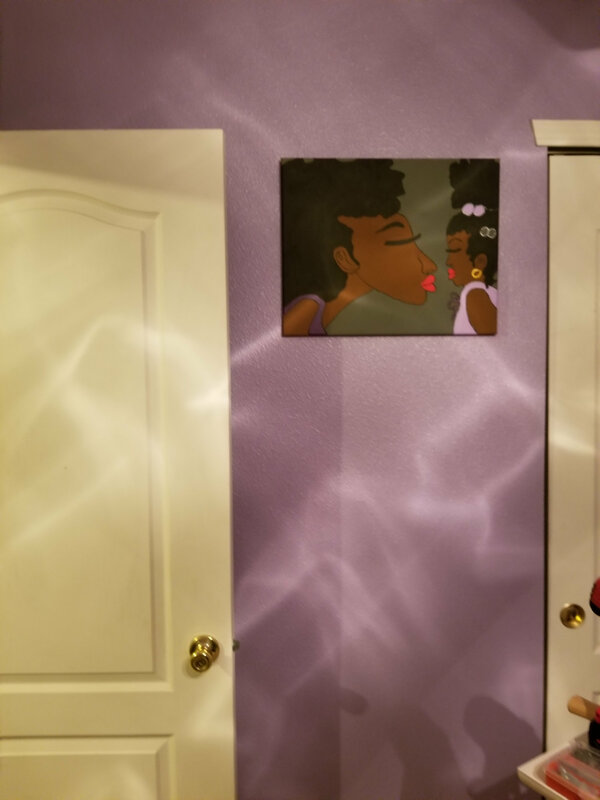 There are also decal stickers of wall murals, if you are into that idea 😊. If you want you are welcome to DM me and I can help you plan one out!! @kristimh80 your looks so classy, I love it!! @kb_momofboys Thank you! 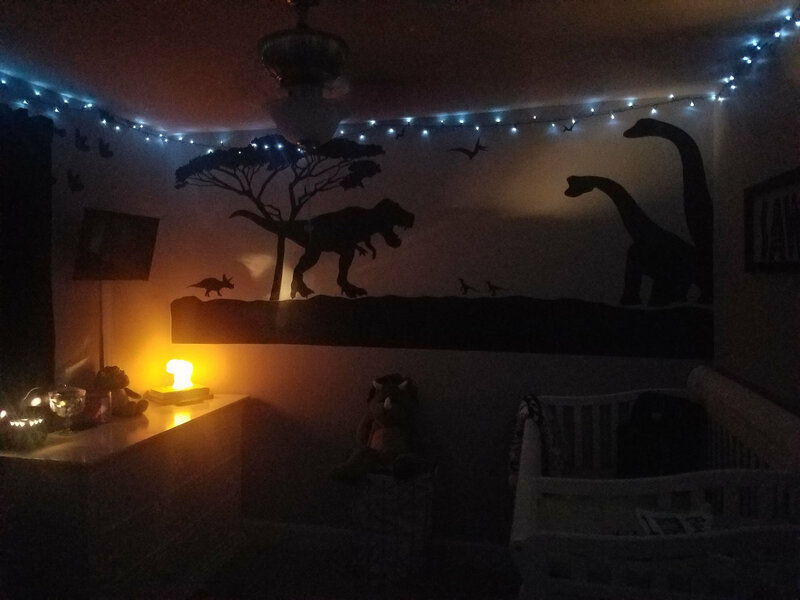 I love your dinosaur room!!! So cute and fun!! 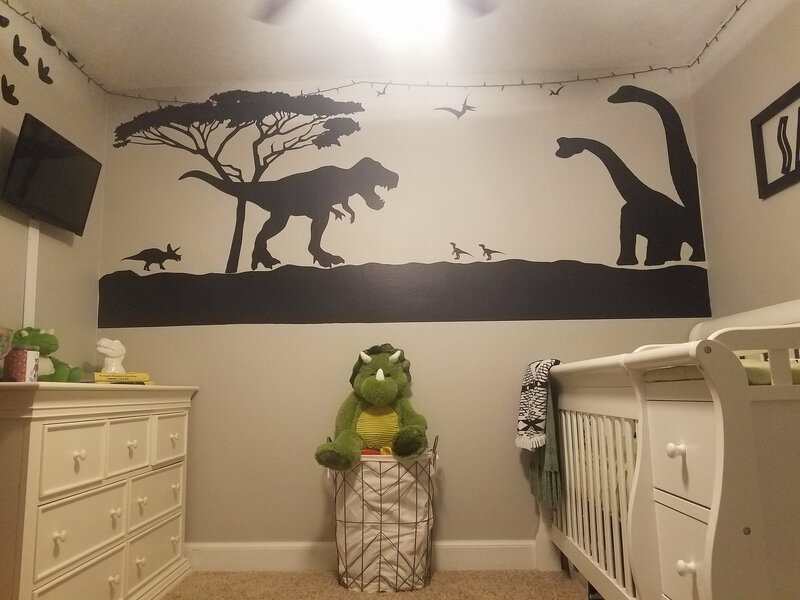 @kb_momofboys I looooooove the dinosaurs!! Great job! @kb_momofboys that looks great! I feel vastly underprepared now LOL! 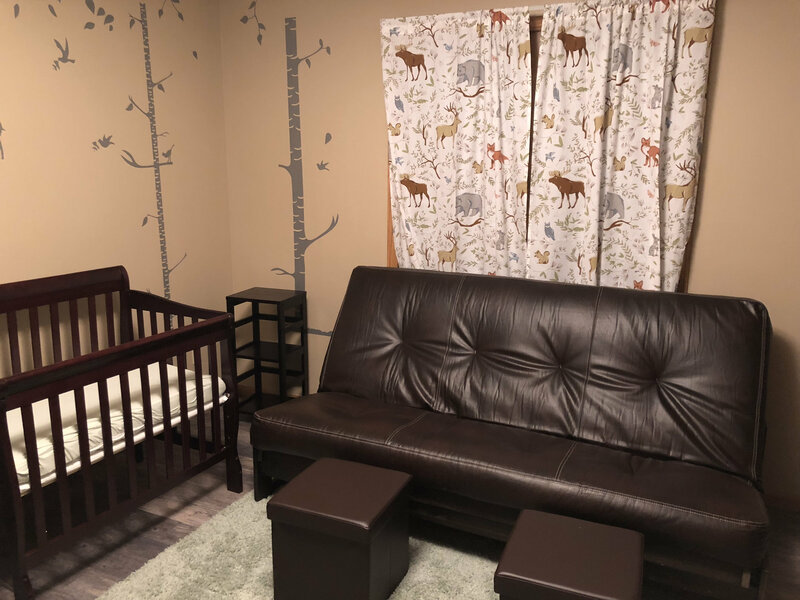 We don't have an extra room for a nursery so baby girl will be shacking up with us for a while, until she's sleeping well enough to share a room with DSS. Right now DSS is in our second biggest bedroom, my husband and I's shared office is in the third biggest, and DS is in the smallest. We're looking at configurations but I think we'll keep DSS where he is and switch the office and fourth bedroom. DS's current room just isn't big enough for two to share. @kb_momofboys Very cute! We're also doing a dinosaur theme with Navy and bright green! @lucysmom2016 that orange is such a fun color! @lucysmom2016 love that orange color! I agree about the orange being awesome!! @lucysmom2016 love the elephants! Thats my planned theme. also agree with everyone, the orange is great. my 9yo would love that, its his favorite color! Thanks, all! Orange is DH's davorite color, and he really wanted an accent color wall, and orange is gender neutral, so we both love it! ￼￼ Almost done but still a little more to do.